The first group of townhouses planned by Shovel Ready Projects is going up next to Penn Treaty Park on the Delaware River. The company plans another 58 homes where the white industrial building now stands. Instead of bringing density to the river, these two developments will feel like suburban enclaves. When Philadelphia released its master plan for the Central Delaware waterfront in 2011, it changed the way the city thought about that chaotic junkspace of warehouses, strip malls, and gas stations. Instead of repeatedly trying — and failing — to imitate the elegant, skyscraper-lined waterfronts of Vancouver and Miami, the plan argued that Philadelphia should focus on attracting more modest residential projects to the river. Mid-rise apartments were what the market wanted, the plan concluded. It sounded like smart advice at the time. By spacing out those smaller buildings, the thinking went, the city would create the beginnings of a true urban streetscape along Delaware Avenue. The mid-rises would populate the river, bringing just enough people to Delaware Avenue to support retail and justify adding a trolley line. The waterfront’s zoning was adjusted to make it easy to erect buildings under 25 stories, using a category called CMX-3. Yet despite considerable enthusiasm for the strategy, the story has played out very differently. Only one mid-rise has gone up over the last decade: PMC’s 16-story One Water Street, next to the Ben Franklin Bridge. Virtually every other residential project has been townhouses. Townhouses have always been Philadelphia’s favorite housing form, so it’s not surprising to see them migrate to the Delaware. Compared to what exists on the waterfront, townhouses are a real improvement. They’re a significantly better use than the Wawa gas stations and storage facilities that some developers have proposed. The Views at Penn Treaty, a group of 19 townhouses developed by Shovel Ready Projects, is much less dense than the Central Delaware Master Plan envisioned. At the same time, those townhouses are doing little to further the master plan’s goal of creating a walkable, mixed-use riverfront neighborhood. The Delaware waterfront’s greatest asset has always been its stunning views and the availability of large, empty tracts of land. The problem with building townhouses on those sites is that they consume lots of space, yet add little in the way of population. None of the new developments are dense enough to support retail. Worst of all, the townhouse designs generally follow a suburban model, one that results in self-contained, auto-centric enclaves. Take the two townhouse projects now going up in Fishtown on adjacent sites between Penn Treaty Park and SugarHouse Casino. Although the two clusters — the Views at Penn Treaty and 1121 N. Delaware Ave. — will be only a street-width apart, they will function as discrete islands of habitation. Instead of the boulevard of apartments envisioned by the Delaware River master plan, Philadelphia is seeing more scattered townhouse compounds, like this one proposed for a site wedged between Penn Treaty Park and the SugarHouse casino. A quick look at the ground plan shows that a landscaped median strip will form a hard border between the Views and 1121. None of their interior streets will connect. That means, if you live at 1121 N. Delaware and want to visit someone in the Views at Penn Treaty, you’ll have to leave your compound and walk along Delaware Avenue. In a city defined by its street grid, no arrangement could be less urban. This plan shows both of Shovel Ready Project's developments. Instead of connecting these two projects with an urban street grid, the two projects will be separated by a landscaped median strip. Both projects are the work of the same developer, Shovel Ready Projects. Because the company acquired the two sites in separate deals, it has treated them as unrelated projects, even though they are contiguous and could easily be combined into a single development. The houses even look alike. Despite their suburban configuration — or maybe because of it — the 19 houses at the Views, and the 58 planned for 1121, are already selling for $1.5 million to $2 million, according to George Polgar, Shovel Ready’s marketing director. But the same sites could have supported several hundred apartments or condos. The popularity of such low-density townhouse developments has become deeply concerning to the two groups charged with overseeing the master plan, the Delaware River Waterfront Corp. and the Central Delaware Advisory Group. Ruben said he worries the waterfront will end up with a string of suburban-style subdivisions. Wedged between Delaware Avenue and I-95, these townhouses sit directly across from Dockside apartments on the Delaware River. The townhouses could also undermine the expensive infrastructure investments the DRWC has been making to lure developers to the river. Because of the haphazard way the Central Delaware had developed in the past, the master plan called for a series of parks along the six-mile stretch there. The belief was that improvements would make the waterfront more attractive to developers, who would then build apartments overlooking the parks. The centerpiece of the plan is an 11-acre cap that will span I-95 between Market and Walnut Streets, reconnecting Front Street in Old City with the Delaware waterfront. The cap, which will be covered with a lush green park, is costing the city $225 million. The first phase of work started last summer. 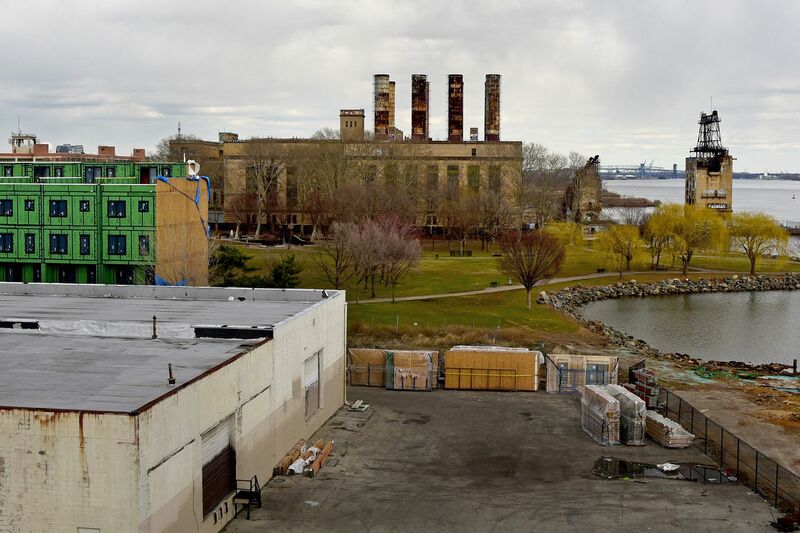 An 11-acre cap is being built from Front Street to the river's edge to spur development. Yet the promise of that park was not enough to persuade an Old City developer to abandon the townhouse model at Front and Sansom Streets. Even though the site, a former parking lot, will have a front row seat on the new park, the developer, U.S. Construction, is now completing the construction of 19 townhouses. That’s not much of a return on a $225 million investment. Job Itzkowitz, who runs the Old City District, told me he was baffled by the developer’s thinking. “This is the biggest park project in the city,” he said. “It should be more dense.” Only a block away, in Society Hill, another developer has proposed a 31-story tower, 1 Dock Street. It’s odd for two developers to see the market so differently. Ironically, the same developer, U.S. Construction, is now considering adding apartments to a townhouse development it plans to build on the Delaware in South Philadelphia. Just a block south of the 19 townhouses in Old City, a developer has proposed a 31-story tower. The open parking lot next to the Great Plaza at Penn's Landing will be covered by the city's new cap, making the waterfront more accessible to Center City. The Front Street site, like most of the land along the river’s edge, is zoned CMX-3, which allows for mid-rise development. But like Shovel Ready Projects, U.S. Construction chose to build less that what the zoning allowed. In a city where developers are always scouring the zoning code for ways to cram more onto their land, why would they build less? There are several possible explanations. Building apartments costs more per unit and take longer than townhouses, especially on the waterfront where the ground is marshy and requires expensive engineering. While housing developers are responding to market demand, they are also responding to the demands of their lenders. Those lenders want to see a quick profit. Townhouses ensure they get it. But Ruben believes there is another reason: Too many loopholes in the CMX-3 zoning classification. He has been working with city planners to revise the zoning code in the hope of encouraging more mid-rises on the Delaware. The 19 townhouses built at Front and Sansom by U.S. Construction will have a front-row seat on the new, $225 million park that Philadelphia is building. Many expected the park to be fronted by dense apartment buildings. Changing the zoning code won’t solve all the Delaware’s problems. But without it, the riverfront is in danger of turning into a long, endless suburb. This was the original proposal for the former Foxwoods site in South Philadelphia. U.S. Construction has since altered the plan to include apartments along with the townhouses.